Studies say that working from sitting to standing within the day has many health benefits. Continuously sitting as you work on your computer, for instance, can cause poor posture, reduced blood supply to the lower extremities and can also make you feel sleepy and therefore inefficient. Some even say that sitting is the new smoking. While the veracity of this claim can be doubted, we all can agree that sitting for long hours definitely hurts in the long run. Standing up or walking around can quickly wake you up; improve blood flow to the body and correct poor posture. And when you want to transition from a sitting to a standing position while you work, you need a good adjustable Standing Desk. Enters – Vivo Height-Adjustable Standing Desk. 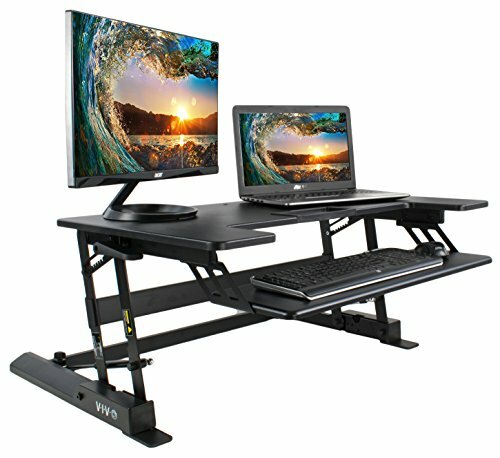 The VIVO Height Adjustable Desk can raise or lower your working table or computer table to meet your needs as you sit or stand. It has two levels and it will fit any standard-sized desk. It is easy to install and easy to use with gas spring power to move the working area higher or lower. If you work with a computer or you use a computer at work then consider a height adjustable desk like VIVO. There are some great features that make this Vivo standing desk a good option to consider. This standing and sitting desk features a very strong steel frame which can hold up to 37.5 pounds. This frame will hold your computer and accessories including two monitors, a mouse, keyboard and any additional accessories and office supplies. The steel frame needs to be installed after taking it out of the box. You will also like that it comes in a black finish that will easily blend with your office décor and style. The steel frame may be adjusted using gas spring power. This makes it smoother and easier for you to adjust the table height with just a squeeze of a handle. You will find that there are eight points of height adjustment and this will let you adjust the table, along with all your equipment to the height that you want to work on. It also comes with a counterbalance tension that lets you adjust the weight of your desk plus all the things on it in one easy movement. The VIVO height adjustable standing desk is designed to fit any standard sized table. It will sit on top of the table and will not move at all because it will be screwed in place. You won’t have to worry about the adjustable standing desk moving or wobbling when you work because this will remain on your desk whether you are standing or sitting as you work. Lets quickly have a look at the good and not-so-good about this VIVO standing desk. This VIVO standing desk has a lot of good things going for it. Below are some good things about it that I like. A standing desk has to go through a lot of rough handling. This standing desk is built to stand and has been built with a solid material. It’s also very easy with this desk to go from standing position to sitting position or vice versa. When you use a standing desk, you’re not expected to stand all the time. For the time when you want to sit, you can easily adjust and bring it to the sitting level. You can say goodbye to feeling light-headed and sleepy while you work at the office or at home. Standing up will quickly wake you and let you focus more. You don’t need to drink more coffee, energy drinks or tea just to keep you awake too. Sitting for long periods has many consequences. Even if you are using an ergonomic office chair or a comfortable executive chair, you will soon suffer from back, leg and shoulder pains because of sitting for a long time. When you stand, you align your spine and let your hips, shoulders, and back regain their position. You can forget using posture correctors or looking for an ergonomic chair to use at the office because all you need to do is to stand as you work. The VIVO standing desk has a very large, spacious working area. It has an extensive room to let you work on two laptops, two monitors or a PC and a laptop at the same time. It has a two-tier system that lets your monitor on the top tier while a mouse and your keyboard sits on the lower tier. You may also use a small storage tray found at the front top surface to store your pens, calculators, mobile device, sticky notes and more. Because you are not sleepy anymore, you will be able to concentrate better and complete assignments and tasks that need focused attention. You will be able to respond to messages faster and work on tasks without committing mistakes when you are not sleepy or too tired. I have personally been using a standing desk for the past two years and I can vouch for the productivity increase. You don’t have to stand all the time, of course. But while you’re standing, you tend to be more productive. VIVO standing desk is delivered as an unassembled unit. You will need to screw the frame together and install the gas spring pump that lifts the table in place. While this is not a huge negative (as the assembly is quite easy), it’s still some extra work that you need to do. Some people prefer getting a completely assembled standing desk. While it’s a good thing that this standing desk is sturdy and made from quality material, it’s heavy to carry. You’re good if you plan to keep it in one place and not move it often. But if you’re thinking of moving it around a bit, this standing desk is not the right choice. There are some reports that it sometimes becomes hard to use. Some customers said that they were able to use their gas-powered spring pumps to increase the height of the table but had trouble lowering it. This may have been overlooked but there is a small space between the keyboard and the table because of the height extender. This could create a strain on the wrist if not corrected. The VIVO Height-Adjustable Standing Desk is a versatile adjustable standing and sitting desk. It is made from durable materials and works by using a gas spring powered pumps. There are many benefits to the health of this height standing desk. It will improve your concentration, reduce errors in work, improves posture and enhances circulation on the entire body. But despite its many benefits, there are some disadvantages to using this desk that should not be overlooked. Failing pumps, poor hand placement on the keyboard and other design fails are indeed things that you must never take for granted.